Very Good. To Own a Dragon: Reflections on Growing Up Without a Father by Macmurray, John, 2006-04-01. Trade paperback (US). Glued binding. 202 p. Contains: Illustrations. Good. To Own a Dragon: Reflections on Growing Up Without a Father by Macmurray, John, 2006-04-01. Trade paperback (US). Glued binding. 202 p. Contains: Illustrations. Fair. 1576837319 Ships from Tennessee, usually the same or next day. I think this book involves you and me and most certainly those living next to us....and our friends, and siblings, and...it's about the influence of a father - present, not present, present but not present - how his relationship IS ours with our God. How we relate to God is, initially, reflective of how we see and relate to whatever father-figure we had growing up. Hence, "To Own a Dragon." Miller thought it would be cool to own a dragon, but it was a work of fiction, fantasy. That is how "Dad" was to him: fiction, fantasy, imagery. He didn't have one. Maturity has given him the opportunity to reflect on the consequences of this. And that is the book: Miller's reflection on what it means to be a dad; what a dad - without intention, even - teaches his kid. How the kid learns what it is to be a "man." The book is geared towards the male gender, and Miller makes this incredibly clear from the beginning. As a woman I found it to be very thought-provoking as to my relationship with my own father. An added benefit is Miller's humor, so very funny and freestyle. I enjoyed it. I have given multiple copies away to friends. This is an excellent book. I recommend this book to anyone, especially young men who have had father issues or no father in their life. 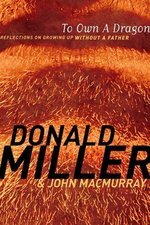 this is my first book written by donald miller, it is supposed to be written for men, but i could relate because i grew up "without a dad". i like his humor and depth at the same time.